Have you ever wondered what it's like to travel on the road with a large, stage illusion show across snow and ice? And what do you do when a herd of bison blocks your path? In this podcast we go behind the scenes, around the props,on the road and into the performers, the Outerbridges. Ted and Marion Outerbridge are Canada's premiere theatrical touring magicians. Recognized as one of the greatest magic acts in Canada, the Outerbridges won the 2011 Award of Excellence from Ontario Contact, an organization of theatre presenters. In 2010, they won Touring Artist of the Year in British Columbia’s equivalent BC Touring Council. I first met them when I emceed their show at the 2013 Abbott's Get Together in Colon, Michigan where they were the feature illusion act. They later closed the I.B.M. convention in Jacksonville, Florida in 2015 and just completed a lecture tour of the U.S.
A professionally orchestrated theatrical production with over 20 custom-designed illusions and world-class lighting and set design, OUTERBRIDGE -- Clockwork Mysteries is a high-energy magical adventure for both adult and family audiences. 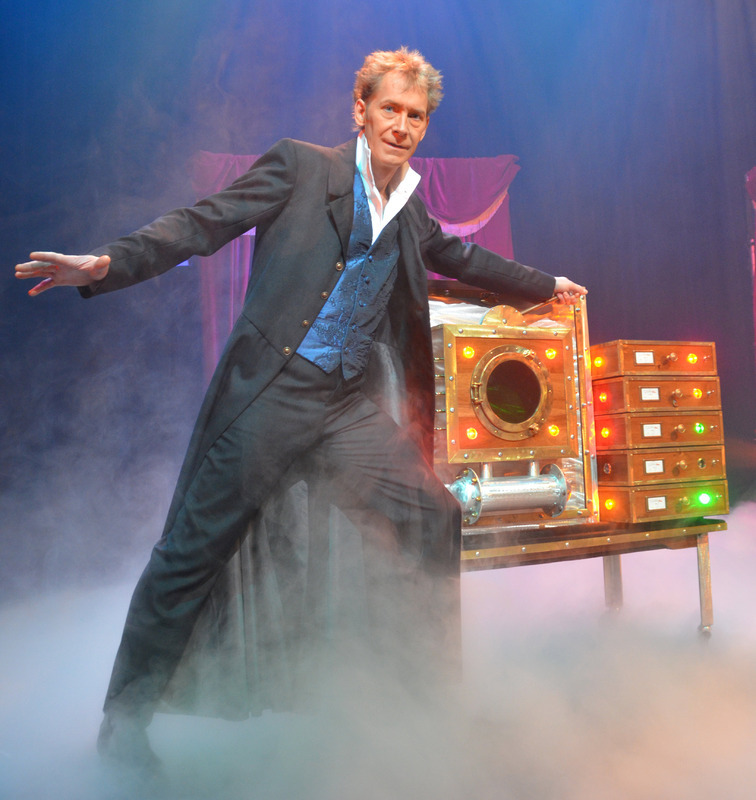 Recognized as one of the most creative and dynamic shows of its kind, critics have hailed Ted and Marion Outerbridge as "the most successful magicians in Canada" and "champions of magic." Ted and Marion sat down at midnight to enjoy acouple martinis and a chat about how they first met and their paths that followed. The myriad stories they shared revolve around working at performing arts centers, what it's like being on the road, how they book shows, and lots of stories and advice. For example, if you want to select volunteers from the audience by using a beach ball, then fill the ball with helium to keep it floating more. Congratulations to Richard Tremblay who won the "Outerbridge Lecture Bundle" valued at $135.00. Please check out current blogs for the newest contest. Tagged with Ted and Marian Outerbridge, The Outerbridges, David Copperfield, stage illusions, touring, Beach Boys, The Illusionists, Chris Kenner, The Supernaturalits. February 25, 2016 by Scott Wells.